When planning your summer planting, it is often easy to overlook non-flowering plug plants in favour of more colourful blooms. But in many ways non-flowering plants are essential to mixed tubs and baskets. We have a range of non-flowering plug plants that are grown for their interesting foliage. These plants add interest and texture to mixed arrangements, and provide a contrast to more colourful blooms. 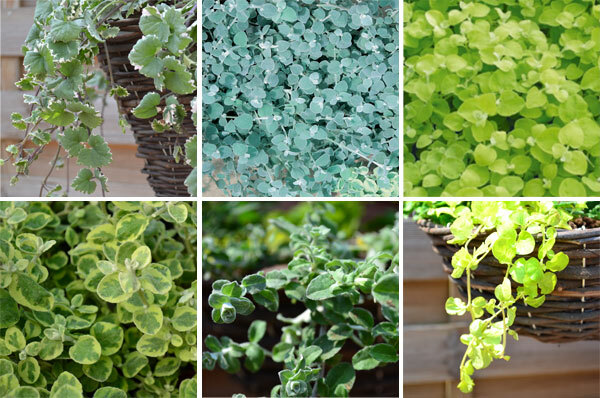 For hanging baskets, Nepeta is perhaps the most popular non-flowering trailing plant, grown for its variegated leaves and long downward trails. Nepeta can trail up to 100cm, creating a stunning effect. Helichrysum is also very well known. The traditional Silver variety is an extremely vigorous trailer with furry, grey leaves. To prevent it from dominating a mixed basket, plant with other vigorous trailers such as Surfinias®, Giant Fuchsias or Lobelia. Helichrysum can also be trimmed to keep it at a manageable size. We also have other varieties of Helichrysum, these being Gold, Variegated and Micro Silver. These varieties are less vigorous than the traditional Silver variety and so are less likely to dominate your baskets. Lysimachia Aurea is a lesser-known trailing plant with small, bright yellow/green leaves that provides a lovely contrast in baskets. If you are stuck for ideas for your hanging baskets, have a read of our hanging basket inspiration article. You can also have a read through our step-by-step guide to planting a basket here. For garden borders or patio containers consider our Cineraria Silver Dust or Coleus Fairway Mixed mini-plugs. Cinereria is a bushy plant with silver/grey leaves that creates a striking effect in contrast to other plants. Coleus Fairway Mixed is a compact plant with brightly coloured foliage. Also worth a mention here are our Coleus jumbo plugs. Whilst these plants are not generally well know for their looks, they do have another interesting feature! Coleus Canina Green gives off a scent from its leaves that should deter cats from the surrounding area. Coleus Canina Variegated deters dogs. Plant these in garden beds and borders or patio containers if you are having cat and dog problems! For more information on how to care for your plug plants, have a read of our guide. previous post: What are plug plants, and why should you use them?